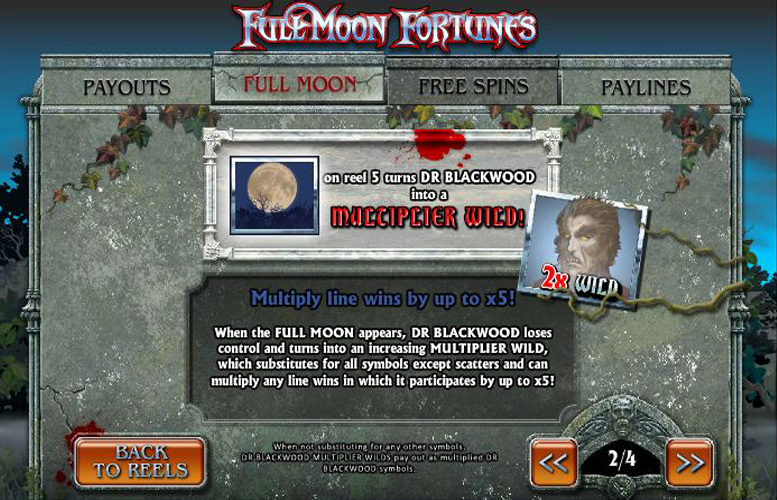 Welcome to Full Moon Fortunes by Playtech, a grizzly insight in the world of the werewolf. This one’s for all you with a dark streak in you. Join Dr Blackwood on a typically full mooned eve, only we’re not trying to stay untouched by the mystical, transformative powers of the night – we’re welcoming them. It’s a game that fully embraces the classic horror theme of shapeshifting, particularly during its interesting take on the tried and tested free spin bonus format. 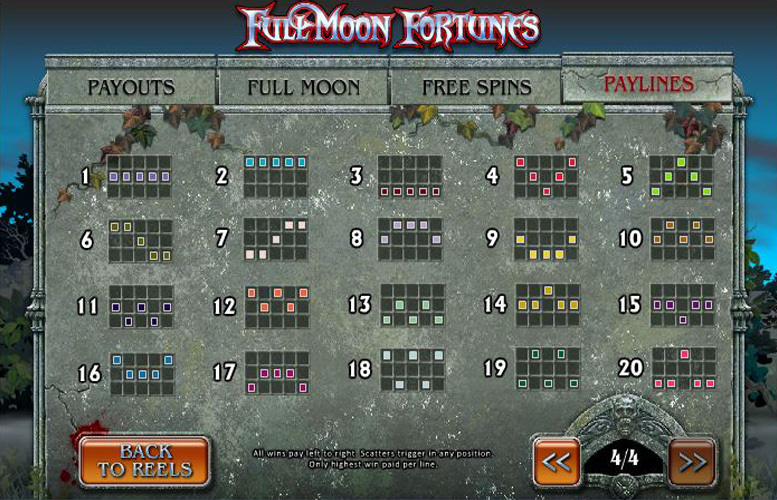 Full Moon Fortunes is a 20 win line slot, with five reels, and three rows of symbols from which players attempt to spin in profitable combinations. It’s a fun game with a great atmosphere, and creepy subject matter that will certainly please fans of horror themed slots. Great style. The Full Moon Fortunes looks, and sounds exactly as you’d hope it does considering the subject matter of the game. The strong visuals and soundtrack really create a chilling atmosphere. Interesting bonus features. There’s one that is completely unique (to my knowledge) and lends itself perfectly to the slot’s theme, and one that provides an interesting take on a combination of classic features. This game is absolutely packed with innovation. More on special features later, however. The pay table is weighted a little too heavily on the special features. This tends to result in a “go big, or go home” kind of machine. This may not be an issue for players who like this but will not please fans of low variance games. The bonus rounds can be pretty cruel if you’re unlucky. 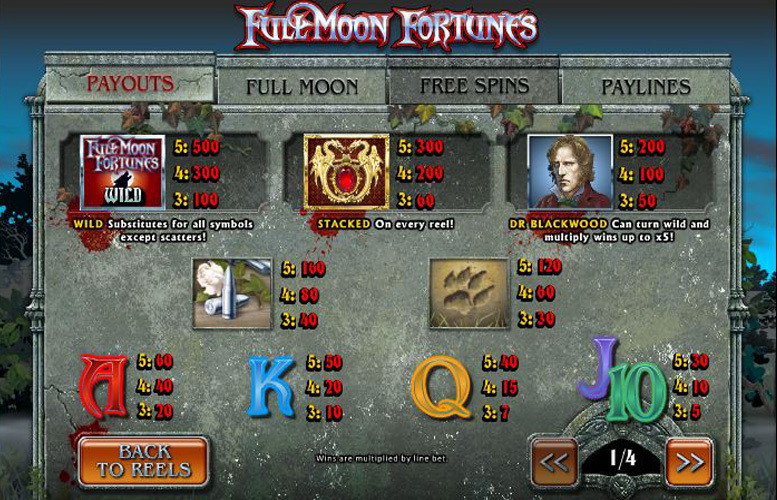 The tiles for Full Moon Fortunes are all typically grizzly for a werewolf themed slot machine. Expect to see occultist symbolism, silver bullets, a hopeless victim, and pawprints out in the woods. Full Moon Fortunes Logo (also Wild) = 500x coin value. Occultist Emblem = 300x coin value. Dr Blackwood (victim) = 200x coin value. Silver bullet = 160x coin value. Wolf print = 120x coin value. 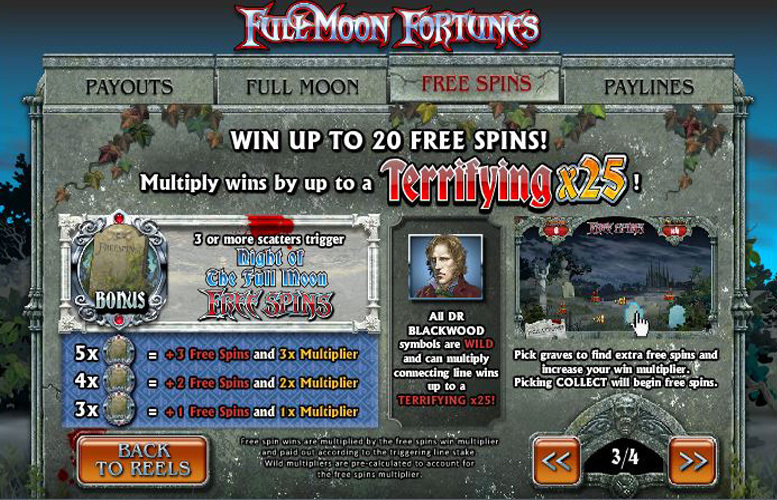 The maximum possible bet on Full Moon Fortunes slot machine is £5. Although the highest possible win for this stake is only £2,500, and small in comparison with similar machines, all is not as it immediately seems in the graveyard. Without a doubt, the best feature of the Full Moon Fortunes slot machine is its two bonus stages. One offers a unique take on two of video slots’ favourite features, and the other is inspired by the game’s subject matter. Creative, thoughtful design such as this makes for an altogether more rewarding experience for the player. At first glance, the free spin bonus round on Full Moon Fortunes appears somewhat of a let-down. I mean, it’s taken you however many spins to get to it, and the best you’re looking at is a 3x multiplier on three spins – not great. Worse still the lowest bonus awarded is a measly one spin, with no multiplier. Before we take our spins, however, we’re whisked off to the graveyard. This where the bonuses second classic element comes in. Under each of the gravestones, there’s a prize. These are multipliers and extra free spins. The maximum possible is a massive 25x multiplier on a generous twenty spins. This is obviously where the big money is won. Additionally, if players are lucky enough to spin in a Dr Blackwood symbol at the same time as the rare full moon is out, they’re in for a treat. The Doctor transforms, and substantially increases their winnings, with a multiplier of up to 5x. There’s also some lower value symbols in the game. These are represented by the upper end of a standard deck of playing cards. Ace = 60x the coin value. Jack, or ten = 30x the coin value. 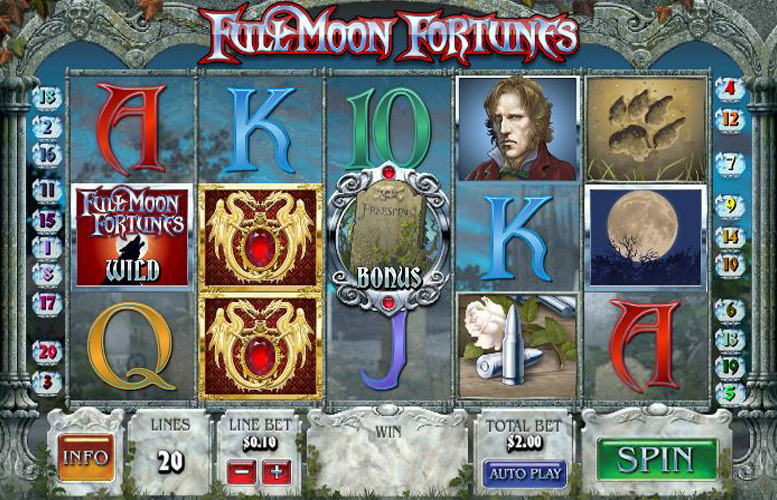 Full Moon Fortune features a load of different ways to mix your bet up. With up to 20 different win lines, and the option to bet between one, and 10 coins per line, and to vary the value of the coin itself; the player has loads of control over where their money goes. The lowest possible bet on Full Moon Fortune is by using one line, and one coin per line is 1p. The highest is using all 20 lines, and 10 coins per line, with coins set at £5. This makes each spin a substantial £1,000. Personally, I love this slot machine. It’s great looking, and really manages to create an atmosphere with its dark imagery, and spooky soundtrack. What’s more, it’s potentially a massive payer, and the bonus rounds may be cruel but represent an innovative take on slot machine design. This game has a rating of 5 / 5 with 481 total reviews by the users.